First, let’s figure out why Microsoft got itself into trouble. Their problems are clearly not related to financial performance. Microsoft is still making money hand-over-fist. The problem is the company’s perception. Microsoft is seen to be lacking innovation and relevance. Not that Microsoft has ever been considered a big innovator - in fact, entire books have been written documenting how pretty much every Microsoft product has been a reverse engineering of someone else’s innovation: Word was a remake of WordPerfect, Excel a copy of Lotus 1-2-3, Windows was inspired by Mac OS, Active Directory was 'stolen' from Novell NDS, XBox from Sony Playstation, Bing from Google...should I keep going? So perhaps the lack of innovation is not the root cause of the Microsoft problem. Or at least not a new cause. But if not, what is? Well, I am convinced that it is Microsoft’s maniacal obsession with their single vendor stack. Back in the heydays when all the hardware vendors decided to try to copy IBM’s success in the PC business and they all started making PCs, this strategy was perfect. Everybody had the same PC architecture that came preloaded with a Microsoft Windows operating system and so every computer was able to run Microsoft software. To their credit, Microsoft made all that software pretty well integrated and the IT departments had to support homogeneous environments where every employee had the same system. Everybody was happy. What computer we used at home didn’t really matter because it was usually a generation or two behind and we couldn’t bring it to work anyway. Today, all of that changed. Thanks to the success of Apple and Google, the computer landscape is much more heterogenous. Operating systems such as iOS and Android have a significant market share and Windows is no longer the only game in town. The devices we use at home are better than the ones we have at work and it is easy to bring them to work and to use them for work. The ultimate Microsoft nightmare is that they don’t run Windows. As a result, all that Microsoft software doesn’t run on many of the computers we use. There are a few exceptions such as Microsoft Office for Mac and my trusted Skype which ran pretty much on everything already before Microsoft acquired the company. Yet Microsoft continues insisting on the no longer existent Microsoft-only world. For example: SharePoint only has a Windows client, Office doesn’t run on iOS or Android, and every Microsoft online service requires a Microsoft Hotmail email address...seriously? 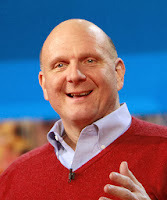 If I were to become the new Microsoft CEO, I would change one main thing. I would stop the Microsoft myopia madness. I would make the different company divisions accountable for their revenue independent of the concerns for any other division. If the Office group wants to port their applications to iOS or Android, let’s have a go at it! If the Windows group decides to make their OS available on a Mac or iPad, let’s do it! If the Nokia team can make a case for offering an Android based device, don’t stop them! Let the XBox group make their games available on other consoles such as Sony Playstation or Nintendo Wii. Embrace tablets that people actually use - not just the ones from Microsoft. Stop playing defense! Stop always worrying about how does your move impact the “cash cow”, the installed base. Open up your strategy, open your software, open your imagination! If Microsoft needs to defend anything, it is not their profits, not the revenue, and not the installed base. It needs to defend their market share. That’s not an easy play for a company that has been used to 95% market share for a couple of decades. Talk about being out of the comfort zone… The market share I’m talking about is the market share of all eyeballs at all times. Not just the PCs. It includes business users just as consumers. It includes desktops, smart phones, tablets, game consoles, TVs, and now also home security systems, thermostats, and wearable computers. That’s the game that Apple and Google are playing and Microsoft has to engage them on their turf. Even books, newspapers, and movie theaters are the competition! That’s the market share that matters. Expecting that someone would ever buy all these products from a single vendor, even one as big and strong as Microsoft, is simply foolish. The world of the Internet of Things cannot be based on a single vendor’s stack. There are simply too many “things” out there. Microsoft has no choice but to open itself up on every layer of the stack. That is the key thing that I would change if I were the new CEO of Microsoft.